Our specialist team, are based in the Arlberg region of Austria and will be available for all of your massage, physiotherapy and physical fitness needs in the comfort of your Chalet or Hotel. 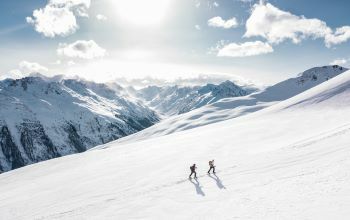 Whether you are injured, suffering from a niggling knee or just fatigued from a day in the mountains, regardless of age or ability we endeavour to get you back on your feet, bike, skis or snowboard, pain free and performing better than before. 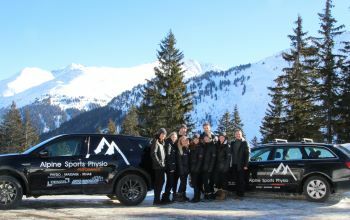 Our reputation for specialist physiotherapy in the Alps stems from our unrivaled professionalism, and friendly approach to treat each client as the individual that they are. We pride ourselves on our personal approach to our appointments. We know how important it is for you to be back on the mountains and during peak season we guarantee appointments within 24 hours. However, it is our priority to be available for bookings at very short notice. Contact us today to book an appointment. Our fleet of vehicles allow us to deliver our excellent services in the comfort of your chalet or hotel room. We also have a clinic in St Anton for guests who would prefer to come to us. Either way we are fully equipped to ensure your appointment suits your needs. Tired Legs? Sports massage, relaxing massage or deep tissue massage. Whatever your style, it’s the perfect way to recover after a day on the slopes. We can also provide multiple therapists for couples or group massage - our most popular service! Using a combination of a treatments, strength and conditioning based rehabilitation exercises and various taping techniques, our specialist therapists will decide on the best way to get you back on the mountain as safely and as quickly as possible. Our classes are designed for your needs - private, group or individual. Whether it’s your first class and you want to try something new, or you’re an experienced Yogi and just want to stretch after a hard day on the mountains, we are here to help. Our Ski like the Pros packages are tailored for groups or individuals wanting to experience elite level support and preparation just like a professional ski team. Packages are designed on the needs of the group and are bespoke for each of our clients. Our specialist team of soigneurs are made up of physiotherapists, sports therapists and massage therapists who are prepared to travel worldwide to make sure you have the best care possible to keep you in the saddle and riding at your very best. Whether you have a programme you’re following at home that you need to continue with whilst on holiday or you are on a fitness retreat in the mountains and would like a trainer to assist with your exercise programme, our excellent trainers are here for you.